Sired by Lord Shiva, he uses his great powers in the service of Lord Rama. Hanuman is easily among the most popular divinities in India. A small monkeylike figure, Hanuman is often portrayed kneeling with joined palms before the Personality of Godhead Ramacandra, Sita (Rama’s consort), and Lakshmana (Rama’s brother). Hanuman is shown sometimes tearing open his chest to show Rama’s image in his heart, other times soaring through the sky with a Himalayan peak in his hand. He is shown long-haired and occasionally five-headed. His hands are often seen in the gesture (mudra) for removing fear (abhaya) and giving benedictions (varada). He is sometimes shown carrying a club, a bow, or a thunderbolt. In the Ramayana, the epic by the great sage Valmiki, Hanuman first appears in the beginning of the fourth book, known as Kishkindha-kanda. For most of that section Hanuman plays a minor role, as one of five emissaries sent by the monkey king Sugriva to discover the identity and intentions of Rama and Lakshmana. Toward the close of Kishkindha, however, it becomes clear that Hanuman is no small character. 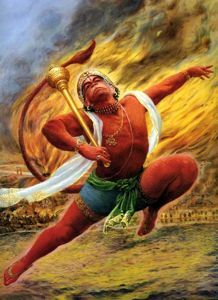 And as we open the next book (Sundara- kanda), Hanuman tends to dominate the stage, his speed, strength, wisdom, courage, and devotion becoming evident. In the Uttara-kanda the sage Valmiki tells of Hanuman’s birth and childhood pastimes. As a young child Hanuman once mistook the sun for a fruit. When Hanuman tried to capture the sun, the demigod Indra knocked Hanuman down and broke his jaw with a thunderbolt. Hanuman’s compassionate father, the wind-god, then induced other gods to shower Hanuman with extraordinary boons, accounting for his well-known physical prowess and supernatural abilities. In youth, Hanuman playfully vandalized the ashrama of forest ascetics, who reacted by cursing him to forget his powers until he would meet Lord Rama. Hanuman would then come into his own and use his powers for the ultimate good of all. Hanuman often displayed the monkeylike qualities typical of his descendants. By his own admission, as cited in the Ramayana (5.53.111), he has a monkey’s unending fickleness (nityam asthira-citta) and inability to remain still even for a moment (anavasthita). Yet Hanuman’s monkey nature is a gift from the Lord, and any resulting characteristic that might otherwise appear to discredit him is actually a divine arrangement for his service to Lord Rama. Though Hanuman has the general look of a monkey, in the Ramayana period—Treta-yuga, hundreds of thousands of years ago—such monkeys were more like human beings. Valmiki makes this clear when he writes about their speech, clothing, funerals, dwelling places, consecration festivals, and so on. Hanuman and the Vanaras, then, were half- monkey, half-human. But they were unmistakably empowered semi- divine beings as well. They could take on any form or, at their will, become large or small. They had all mystic yogic perfections in full. Valmiki writes that Hanuman could leap into the air like a super-powered being. Impressed by Hanuman’s amazing qualities, many people in India see Hanuman as though a god on his own, independent of Rama. Often he is worshiped as an independent village deity—a protector against ghosts, diseases, and so on. And so in India today two distinct “Hanumans” have emerged: the humble devotee, as he was originally known in the Valmiki Ramayana, and the independent divinity, worshiped without reference to Sita or Rama. But the scriptures make it clear that Hanuman and the Vanaras are devotees, not gods. Throughout the Sundara- kanda especially, the Ramayana clearly shows Lord Rama’s superior status. There, through beautiful soliloquies drenched in devotion, Hanuman showers Rama with praise again and again. Hanuman is clearly the bhakta, the devotee, and Rama the Bhagavan, the Lord. It is the glory of Hanuman that He serves Rama by going to find Sita, by bringing her Rama’s message, by risking his life at the hands of evil Ravana. Indeed, the entire Ramayana offers tribute to his unswerving devotion to Lord Rama. Later commentators as well praise Hanuman’s devotion. In fact, while discussing devotees who perfectly represent each of the five rasas, or relationships one may have with the Lord, Sanatana Gosvami, in his Brihad Bhagavatamrita, mentions Hanuman as showing the perfection of dasya-rasa, or servitude. Hanuman is the devotee, the servant of God, par excellence. Perhaps for this reason, Lord Rama saw fit to bless Hanuman by allowing him to stay in this world to serve Him as long as the glories of Rama are sung. The Mahabharata notes that the immortal Hanuman lives in the Himalayas to this day, chanting the name of Lord Rama in perfect ecstasy. When Lord Krishna descended five hundred years ago as Sri Chaitanya Mahaprabhu, devotees of Krishna and His incarnations descended with Him to be part of Lord Chaitanya’s lila, or pastimes. One of those eternal associates of the Lord was Hanuman, who appeared with Lord Chaitanya as a physician named Murari Gupta. “Murari Gupta heard from Me again and again. And by My influence, his mind was a little converted. “After this, Murari Gupta went home and spent the whole night thinking how he would be able to give up the association of Raghunatha, Lord Ramachandra. Thus he was overwhelmed. Murari Gupta then began to pray at the lotus feet of Lord Ramachandra. He prayed that death would come that night, because it was not possible for him to give up the service of the lotus feet of Raghunatha. Thus Murari Gupta cried the entire night. There was no rest for his mind; therefore he could not sleep but stayed awake the entire night. “In the morning Murari Gupta came to see Me. Catching hold of My feet and crying, he submitted an appeal. “Hearing this, I became very happy. I then raised Murari Gupta and embraced him.